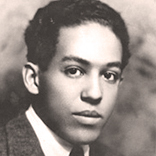 James Mercer Langston Hughes (February 1, 1902 – May 22, 1967) was an American poet, social activist, novelist, playwright, and columnist. Hughes was one of the earliest innovators of the then-new literary art form jazz poetry. Hughes is best known for his work during the Harlem Renaissance. "I have discovered in life t..."
"I stay cool, and dig all ji..."
"Let the rain kiss you. Let ..."